Happy Valentine's Day, peeps! V-Day is not a big deal around here. We're pretty lovey dovey all year long. What Valentine's does mean is a Valentine's Day party at school. And that means a Valentine's box. I honestly wouldn't mind making B a Valentine's box. But he wants to make his box. His mind is brilliant and creative. His hands don't always see the vision. Nevertheless, he wants to be in control of his box. I learned years ago to let go of my Pinterest mom dreams of crafts with my B-man. He wants things done the way he wants them done and I wouldn't fight him. Please see my post The True Story of Robo-Turkey That post cracks me up because I was so anti-home project. I'm softened a little, probably because the older boys don't get them anymore and I'm overwhelmed with everyone's home projects. Look at me, growing and stuff. Anywho...remember yesterday I said we went to Joann's and got stuff for B's box? 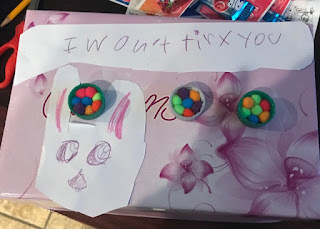 He wanted to make his box look like a four armed alien from Ben 10. I had a fabulous plan for that box and a ton of red pipe cleaners to make it work. Alas, I spent the better part of Saturday in bed and B's creative juices couldn't not be stopped. I should pause here to tell you that is currently obsessed with old cereal commercials and cereal in general. It started with old Fruity Pebbles commercials on YouTube kids and has blossomed from there. I'm actually glad we've moved on from Fruity Pebbles because I'd been called up one more than once to tell him everything I knew about the Flintstones. Here's the box B-man made, all on his own. Those little pom poms were supposed to be alien eyes. But, glued into bottle tops, they look like Trix cereal. And my sweet boy is ready for the big day. He also has a Valentine. "I asked and she said yes" He made sure to ask her favorite candy is taking her a Hersey's Chocolate bar.